Great landscaping can take many forms: grand or modest, formal or casual. It is whatever works for you and your family. In all cases, it’s a place where you can relax, entertain friends, and reconnect with nature. 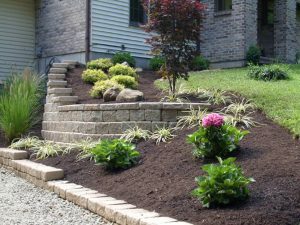 A Dean’s Landscaping design will enhance the value and beauty of your property. Whether it’s renovating old and overgrown landscaping or starting new, Dean’s landscaping makes the process effortless and worry-free. We listen to your ideas and create a design that fits your needs and your budget. If you are the customer who is not sure of what you want, we can start from scratch or implement a design off of your own creative ideas. With all of Dean’s Landscaping designs, it’s not just a matter of designing structures and plantings, it’s also about your grading, drainage and irrigation needs. *Dean’s Landscaping offers mulch-blowing services, you prepare the site and we will blow the mulch in.